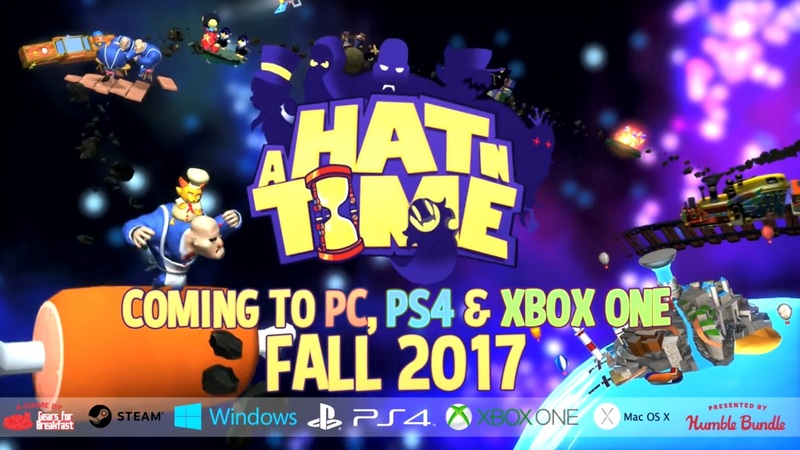 A Hat in Time is Coming to the PS4 and Xbox One! Prior to Yooka-Laylee, FreezeMe and Poi, there was one other 3D platformer that started the whole genre revival off. Named A Hat in Time, the game starred a character called Hat Kid as she collected pieces of time in various worlds, all while avoiding the machinations of the evil Moustache Girl. It looked great, did really well on Kickstarter (raising over $296,000 in funds there) and eventually kicked off the entire N64 collectathon revival altogether. But while the games it inspired came and went, A Hat in Time has continued trucking away in the background. We’ve seen fantastic new levels set in places like a train and a film studio. We’ve seen interesting costumes and mechanics from the game posted on Twitter. And in general, we’ve seen a lot of things that indicate this will be an amazing 3D platformer. Perhaps even the true return to form the genre has needed. Yet for all that, it wasn’t ever really announced for consoles. Somehow, the latest in a genre made for home consoles has remained a PC exclusive since the start of the development. It’s pretty good all things considered. However, it still leaves one very obvious question here. And that’s why it’s not been announced for a Nintendo system yet. Seriously, this game is made for the Nintendo audience. It’s inspired by Mario Sunshine, Banjo-Kazooie and the Legend of Zelda The Wind Waker. It’s a game the Nintendo fanbase would adore, especially if you take their interest in Yooka-Laylee and Super Mario Odyssey as an indicator here. Meanwhile the players on the other systems are… perhaps a little less endearing towards games like this. =Remember, Rare tried it on the Xbox and Xbox 360. It’s why Microsoft bought them, and why Grabbed by the Ghoulies, Viva Piñata, Banjo-Kazooie Nuts and Bolts and others were released on Microsoft’s systems. Yet their fans didn’t really care. The games just didn’t sell to the Xbox demographic. But it’s just the wrong type of game for those consoles in general. It’s one Nintendo fans would likely buy into more. So let’s hope Gears for Breakfast takes some notes and announces a Switch port at some point. Cause if so, I’m buying the game on day 1! Nintendo Announces Nindies Showcase Video! The 3D Platformer Comparison; Yooka Laylee, A Hat in Time or Lobodestroyo?